Дмитрий Босяченко – писатель, социолог, маркетолог. Родился в 1987 году. Пишу прозу, сценарии. Дебют — повесть «Ждать», изд-во «Издательские решения» (2015 г). Выпускник школы писательского мастерства Creative Writing School под руководством Майи Кучерской (2015 г.). 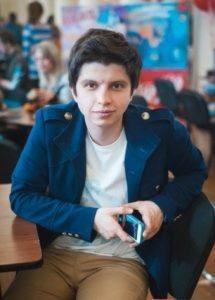 Dmitry Bosyachenko is a writer, sociologist, marketer. Was born in 1987. I write stories, screenplays. Debut — the story «Wait», publishing house «Publishing decisions» (2015). Graduate Creative Writing School, under the leadership of Maya Kucharski (2015). «It’s summer, and you are all in black». We met in an old, almost ancient coffee shop in front of the Kazansky railway station. «I look slender in black». «Don’t be silly, you didn’t put on much weight». A waiter came up silently. No smile. The coffee shop was old and it did see all sorts of people. «You are eating too much sweets». «I’m trying to eat as much as possible, as long as I can». «That is impossible. You cannot make your life sweeter in advance». They remained silent for a bit. Soon their order arrived. He starred in his cup like a fortuneteller. She was gazing out of the window. «You know, the times aren’t that great now».